Two stabbings in the US have been linked to the fantasy horror character Slender Man. Who is he? The Know Your Meme site defines Slender Man, or Slenderman, as "a mythical creature often depicted as a tall, thin figure wearing a black suit and a blank face". In the mythology "he can stretch or shorten his arms at will and has tentacle-like appendages protruding from his back". 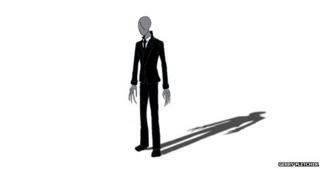 Representations of Slender Man can be seen in many guises. On the Etsy craft sales website, there are key rings, bracelets and stuffed toys. On Flickr and Instagram, you can see everything from Slender Man fancy dress to Lego tableaux. Hundreds of thousands click on YouTube videos based on the character. He crops up on blogs in graphic art and fan fiction. Every depiction riffs on the central characteristic of the black suit and blank face. And the thinness. The Slender Man meme began in June 2009 when a competition on the comedy web forum Something Awful asked for ideas for a modern myth with which to terrify people. One contributor, Eric Knudsen, using the pseudonym Victor Surge, responded by posting two faked photographs, purportedly from the mid-1980s, showing a tall, sinister figure lurking behind groups of children. Knudsen attached some vague text suggesting 14 young people and the photographer had gone missing. From the very beginning it was intended to be a meme - in the original sense of a replicating idea. Knudsen's fragmented post prompted a creative outburst. Eventually thousands of people were making drawings and writing stories. Slender Man has appeared in video games, while Marble Hornets, the YouTube series featuring stories about him, is followed by more than half a million people. One academic has described his development as an "open-sourcing of storytelling". "It just exploded. It became a phenomenon that I don't think anybody could have predicted," says Jeff Tolbert, a folklorist from Indiana University, who has written about Slender Man. The character almost seems to be an amalgam of knowing winks to both internet and pre-internet culture. Like folk villains over the centuries, from the Big Bad Wolf to the Headless Horseman, Slender Man is often depicted standing in the woods. His tentacles conjure up fleeting hints of HP Lovecraft's world of interdimensional monsters in ordinary settings. The black suit nods at the Matrix villains, Jack Skellington from The Nightmare Before Christmas, and even the Hitman video game series. But all those could of course be coincidental. Fans of the character can hold strong views about the way it should be used. "There were a few instances where someone would try to take Slender Man in a different direction," says Tolbert. "One came up with a story of a military group trying to track him. Other users didn't like that idea. It was too obvious. It lacked subtlety. It was more like an X-Files story than a proper myth. There is a sort of consensus about Slender Man. People collectively take on some bits and reject others." Many of the fan stories have ended up on the Creepypasta website, where paranormal stories are shared, delivered as if they are true, rather in the fashion of campfire tales. But mainstream media attention for the phenomenon has been scant up until now. There was a brief spike of interest in the summer of 2012, according to Google Trends, possibly related to a video game. But the latest flurry of stories centre on a number of alleged violent crimes with links to the character. Fantasy creature invented by US horror writer HP Lovecraft (1890-1937), Cthulhu is an ancient creature, who "waits dreaming" under the sea: "A pulpy, tentacled head surmounted a grotesque and scaly body with rudimentary wings"
First appeared in book The Call of Cthulhu: "It lumbered slobberingly into sight and gropingly squeezed Its gelatinous green immensity through the black doorway... After vigintillions of years great Cthulhu was loose again, and ravening for delight." Spread through popular culture after Lovecraft's death, now seen in fan fiction, sundry internet memes and even crafts (above). It was reported last week that two 12-year-old girls in Wisconsin had allegedly stabbed their friend 19 times in an effort to show their dedication to Slender Man. They apparently learned about the character on Creepypasta. Meanwhile, a mother who was stabbed by her daughter in a second incident in Ohio has also blamed an obsession with Slender Man. Creator Eric Knudsen has already said he is "deeply saddened" by what happened in Wisconsin. The operator of Creepypasta issued a statement, extending condolences to the families involved but adding it was not "the fault of Slenderman or horror writing in general that this happened". "The fact that Slender Man is being mentioned in connection with a real-world act of violence is troubling but the exact significance isn't going to be known for a while," says Tolbert. "Slender Man is definitely not the problem. Clearly there are people who are trying to blame this figure. It's becoming a moral panic, with people suggesting Slender Man is inspiring people to murder. It's definitely a mistake to target Slender Man or any of these creations. It's important for all of us to be aware of what children are doing and try to provide a context for interpretation." But it's perhaps easy to see why parents might be concerned. The rapid permeation of the meme, and the fundamentally innocuous nature of it, are not immediately apparent. "It goes back to the adult fear of not being in control of what your children are doing or creating," says Tom McKean, a folklore research fellow at Aberdeen University. "We have this fear of the unknown, that we don't know where our children are, that they are vulnerable." McKean likens Slender Man to an urban myth about an unknown person who goes around daubing people's garden gates with red paint and returns to steal their children, pets or even household appliances. Yet unlike most such tales, developed and adapted over long periods, the origins of Slender Man are absolutely clear and very recent. The character's very design, with its inscrutable blank face, was explicitly designed with a vagueness associated with stories of the past, like the universal bogeyman, blamed for mischief of all sorts. With massive mainstream media attention, the way the meme is used could change rapidly. It is no longer just a thing of forums and blogs. "What Slender Man shows is the amazing speed and power of the internet to spread the stories," says Trevor Blank, assistant professor of communications at the State University of New York at Potsdam. "The awful events in recent days may see interest in Slender Man decline or it may continue in a different way, depending on how contributors and fans react. But one thing is for sure - there will be other stories. Folklore doesn't die."